Pittsburgh is experiencing a rainy year. To local residents, this is an understatement. 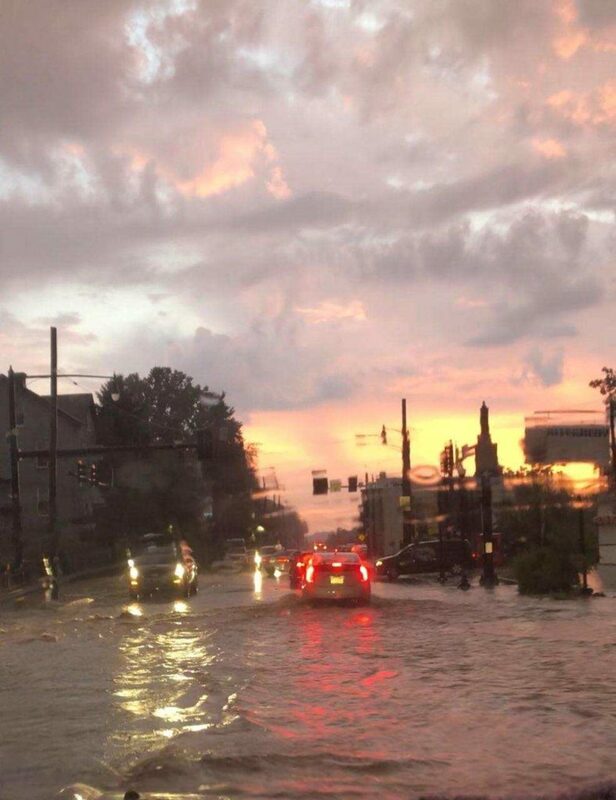 With a 75% increase from the normal rainfall for the region, receiving over 34 inches through June 27th, 2018 has stolen headlines, swept away cars, claimed lives and caused significant monetary loss for residents and business owners alike. While the rain has currently slowed, the water is still causing problems and, to many, uncovering a moldy history in their homes. As a mold remediator in Western Pennsylvania, I have been in countless residences where the owners have stated, “My basement has never been wet”. The drastic increase in falling rain has saturated the ground surrounding the homes in the region. Previously dry and well drained properties are reaping the unfortunate overflow, receiving extra water and causing problems fast. Some molds can grow quickly, taking a tight grip on a property within 48-hours of a water intrusion event. That being said, most of the issues I see have been present for some time, meaning these families have been breathing mold hidden in plain sight. How does Rain Impact Mold? Where can mold hide? To answer this, we must first understand what mold needs to survive. Mold needs water, food, and air to grow. Water is the problem, mold is the symptom. Countless homeowners look in their basements for leaks and standing water thinking that without seeing actual water, there won’t be any mold. This is simply not the case. In Pittsburgh, basements tend to be damp, or maintain a high level of humidity. This humidity can be invisible to the naked eye and can often be the total cause of seemingly insurmountable mold issues. Basements are often times used to store belongings, keepsakes, and seasonal items. The issue arises when these contents are stored in cardboard boxes, which are food sources to mold. Mold hides within the cavities of the box and eats away the very thing thought to protect our treasures. To increase the issue, most boxes are stacked against the foundation walls or out of the way in a corner to allow for easy passage through the homes. This also causes problems, as the boxes will pull moisture from foundation walls and decrease the regular air flow against walls. This creates a perfect habitat and food source for mold to take hold. Not all mold is bad though right? While this statement is true, mold should ALWAYS be controlled so it doesn’t become an issue that poses serious health risks. Even the most common of molds can cause allergic reactions, sickness, and general feelings of ill-being. Just because the mold doesn’t look black in color, does not mean it’s safe to breathe or even that the mold in question isn’t THE black mold (Stachybotrys). Furthermore, remember that everything is a poison in the right dose. If you have mold in your home, call a professional. First and foremost, have someone evaluate the situation who knows what they are doing. Mold remediators are not regulated in Pennsylvania, so be careful and ask knowledgeable questions to make sure your chosen company will ultimately solve the concern for you and your family. The best advice I can give is not to panic; mold is more often than not a solvable issue. For those of you who don’t have mold, how can we prevent it as the rain increases in our region? There are some simple solutions to make your home a non-optimal mold environment. First, ditch the carboard. Opt-in for Rubbermaid or plastic bins to store your belongings. These bins don’t absorb water and are easily stackable, making for great organization and mold deterrent. Next, utilize a dehumidifier in your basement. When choosing a dehumidifier, pick one that is rated for the size of your space. I recommend a model that comes with a built-in pump so you don’t have to remember to empty the bucket. I see many dehumidifiers that have taken on the role of a clothes rack after one rainy season. Don’t let that happen to you. Set your dehumidifier at 50% and let it run. Don’t be scared if it runs continuously at first since the machine is making the biggest humidity adjustment it will ever have to, assuming you use it regularly. Here is a good resource for choosing the right sized dehumidifier. A tough but necessary task is to nix the carpet in finished basements. Carpets can soak up gallons of water before they show signs of moisture and are very difficult to properly dry. The carpet will also hold dust, dirt and dander, many food sources for mold. When choosing your basement flooring, look instead at something that leaves your floor drains open and doesn’t soak water, like a floating laminate. Your floor will have a longer life and be easily cleaned in the event of a spill or small water issue. To fix problems inside, sometimes you have to go outside. Don’t forget to look outside either. Many times, easy outdoor maintenance will suffice to keep water out of your basement to begin with. Make sure your landscaping is sufficiently graded away from the house, draining water away from your foundation. Keep your gutters and downspouts in good working order making sure rain water flows in them correctly and drains away from the house. Make sure the connections are maintained and that the pipes are not clogged when landscaping. Most houses can solve all of these issues within a weekend, making for a well maintained, water free, mold resistant environment. If these protocols are followed and water still infiltrates your living space, your cardboard free basement helps make it easier to clean up for you, or a expert if needed. The best advice in this situation is to not panic, call a trusted professional for a recommendation. Remember, keep your basement dry, and here’s to a warmer, dryer Pittsburgh summer!